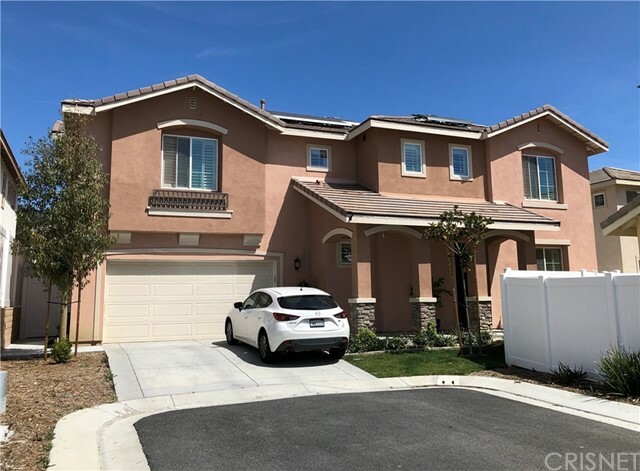 All Fillmore homes currently listed for sale in Fillmore as of 04/25/2019 are shown below. You can change the search criteria at any time by pressing the 'Change Search' button below. "Wow! Just when you thought you could no longer find land with its own well. With all the water restrictions in the Fillmore area, having your own well is priceless. The well was re-done about 2 years ago. The water level at that time was 15 feet. It seems that water will not be a problem for many years to come. This might be the opportunity you have been waiting for. Over 31 flat usable acres. The property includes a mobil home and an addition three bedroom home that is being used as storage. The property has around 180 orange trees and six large water cress beds that have not been used. The land has been used by row crop farmers because there is plenty of water but the land is suitable for a nursery, citrus, including avocados. The property is conveniently located near the 126 HWY, next to the Fillmore fish hatchery but very private. It is very close to the sphere of influence in the City of Fillmore . You will fall in love with its peacefulness and tranquility. You will really enjoy its mountain views and privacy. Do not let this opportunity pass you by!" 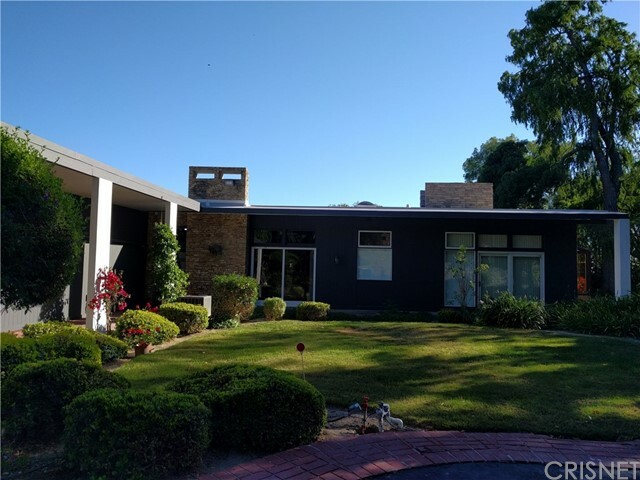 "This classic Mid-Century Modern home was designed by Wilson Stroh and Wilson. The home s architectural features include extensive custom wood paneling, cabinets, soffits and fixtures from this era. The original architectural considerations have been carefully preserved. It is a sanctuary and escape from this century. The property s infrastructure has been completed overhauled. A private well currently produces over 100 gallons of water per minute for ALL agricultural and domestic applications. 1,600 feet of water main has been replaced to Supply NEW 5,000 gallon domestic water storage tank and a huge concrete agriculture water cistern. The water systems automated and controlled via a CUSTOM property wireless network for well pump operation, water storage levels, all irrigation pumps and controllers and the domestic supply system. Custom water filtration system for the domestic supply. NEW ORCHARD AUTOMATED IRRIGATION SYSTEM. NEW COMMERCIAL GRADE roof, new plywood sheeting and double insulation. House exterior eaves enclosed, NEW 400 amp main service, all new service cables brought to code, to interface with NEW PAID FOR 20KW SOLAR installation. Charging Station in the Car Port. New fiber optic internet line installed in conduit to the house. NEW CAT6 and COAX for internet and security cameras. Beautiful Pool and Tennis Court Facilities. NEW Pool equipment, replumbed and rewired. 800 plus Haas avocado trees and numerous citrus and apple trees. Too many Upgrades to mention!" "One of a kind home rich in history is in the Bardsdale area near Fillmore. Stunniing interior. Home has approx 5,926 sf and was originally the Bardsdale School. Owners have made this property into their personal residence, This is one of a kind nestled on 2.03 acres. There are two fireplaces and a pool. The busbarn was once a second dwelling.There is a 10,980 extension of the original lot which may be sold separately. Lot frontage is 525 sf. Includes a barn or carriage house, and 160 avocado trees. Owners are purchasing a uniquely similar property already identified. Property has its own well and Southside Water. Beautiful and uniquely different. 'On June 8, 1889, the new schoolhouse was accepted by the trustees. A motion was unanimous ''That the schoolhouse should not be used for dancing, and that smoking and chewing tobacco be prohibited in the schoolroom and smoking on the ground. Miss Minnie Taylor was the first teacher. She began on August 12, 1889, earning $60 a month. The school had one room, with a huge sheet iron stove in the back, and a cloak room. There were two entrances, one for the girls and one for the boys, and the desks and seats were made for two students. There were nine grades. It was built for $1,397, excepting outhouses." 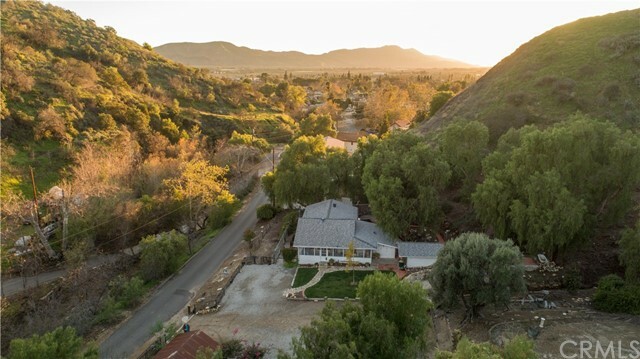 "Spectacular views from this hillside ranch home on 20.65 acres. 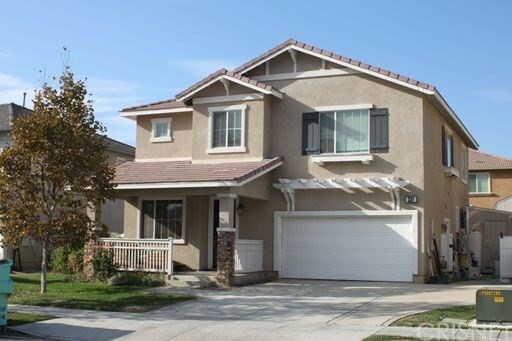 4 bedroom, 3 bath home with approximately 3,300 SF was rebuilt as new after fire in 2013. Custom work throughout includes extensive built in storage cabinets, entertainment center, kitchen cabinets, granite kitchen counters, laminate wood floors and windows that take in the views from nearly every room.. Additional features include Code upgrades, pantry, office, recessed lighting, access to outdoor patios from several rooms, dual HVAC units and stainless steel appliances. Outdoors you will find the refreshing pool overlooking the valley, hot tub and Barbecue area. Three garage spaces, one enclosed storage room and rear patio covered storage gives you ample room for items needed in the country. Approximately 9 acres of avocados and oranges are planted on the parcel with some inter planting needed to upgrade the grove. Private well serves the ranch for irrigation and residential uses. Additional locations on the property are suitable for gardens, barns, storage or RVs/boats. A pond and waterfall were once a pleasing feature on the property as well. This is a great all around location for residential, agricultural and rural living." "Secluded Getaway for full time residential use or weekend escapes. This enchanting location captures you at the entrance to the property by crossing over Pole Creek. The seasonal sounds welcome you to the park like setting perfect for outdoor gatherings. The 1950's home has been nicely renovated within the last 6 years. The quality of this charming home is evident everywhere you look with wonderful upgrades. The gourmet kitchen opens over the breakfast bar to the dining and living areas. Attached are the outdoor patios and BBQ structure. 3 comfortable bedrooms and a spectacular bathroom complete the lower living area. The loft above serves as a master suite complete with a large seating area, pot belly stove and viewing decks. The home is surrounded on two sides with a covered patio entrance that leads to a beautiful rose garden. Serene locations include mature sycamore trees and the picnic area overlooking the creek. Included is a metal garage/shop/storage building with approximately 800 SF and two roll up doors. A two car carport is attached with additional covered and open parking in the rear. This unique property is absolutely captivating. You will never want to leave." "Located along one of Ventura County's prettiest country drives, this custom Italian Mediterranean villa takes in Mother Nature all around. Set on 1+ acre, the property consists of a 3,220 Sq Ft MAIN RESIDENCE with 3br/2.5bth, and 860 Sq FT DETACHED GUEST HOUSE with 2br/1bth. Standing in the front courtyard and pool terrace, one immediately notices the wild Sespe River and majestic Los Padres Mountains just across the street! The interior is no less impressive. Step inside the main house to Old World charm with elegant upgrades and modern appliances. Vaulted wood-plank ceilings, authentic travertine tile floors and tall patio doors are just a few of the features the owners painstakingly thought of when designing the home. The large living room and adjacent dining room are ideal for entertaining family and friends. The country kitchen features granite counters, glass tile backsplash, Monogram appliances and custom cabinetry. Step down into a warm family room with wood-like floors and large bay windows with views towards the mountains. The residence is surrounded by a family orchard of avocado, orange, lemon, and other assorted fruit trees. The guest house can generate a nice monthly income, or be home to extended family or invited guests." "Charming Craftsman's estate home in a prime country setting. This beautiful & unique property sits along the hillside and has gorgeous views including a year round creek across the street. The first floor has a large kitchen, breakfast area, peaceful office/den with French Doors and laundry room. Upstairs you'll find a great room with family room, large balcony with French Doors, cozy dinning room, country bar, 3 spacious bedrooms, crafts room and a wonderful master bedroom with walk-in closet and French Doors that lead to a private balcony. The home also offers a Big Circular Driveway with RV parking and a finished 2 car garage with shop area. Conveniently located to Santa Barbara and Los Angeles." "This is a beautiful home which has been made lovely from the top down and all around. 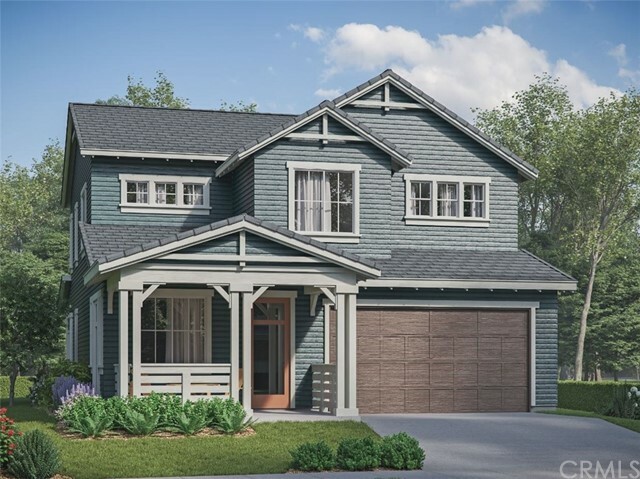 The detached garage is just as beautiful with its finished details for bonus room, art studio or he/she/shed--plus room for RV parking away from the front of the home. The meticulous flagstone entry way is a clue to the what awaits you inside the customized double entry doors. Gleaming wood floors maximize the utility and beauty. There is a large dining area adjacent to the kitchen with sparking countertops, fixtures and cabinets. There is a wood burning stove in the living room and fireplace in the master bedroom for extra heating comfort and efficiency. The master bath has double sinks with a beautiful rockface tub and tiled shower. Roof was new in 2013. One bedroom is perfect for guest quarters with a priviate entrance. Located on the quiet end of Mountain View near Blaine Avenue." "Unique opportunity to own a large, beautifully updated single story home in the heart of Fillmore. With approximately 3,108 sq feet of living space, this 4 bedroom, 4 bath home is perfect for a large family that enjoys space. Living room with wood floors, bay window, oversized ceiling fan, and fireplace with shiplap siding. Den off the living room is perfect for a kids playroom or home office. Kitchen with Oak butcher block countertops, artisan tin decor backsplash, newer cabinetry, farmhouse single bowl kitchen sink, and ample natural lighting from multiple windows. Dining room could comfortably seat the entire family. You'll be no less than impressed with the size of the laundry room, the size of each of the bedrooms, and that two of the four bedrooms have ensuite bathrooms. Additional upgrades includes two newer A/C units, newer furnace & attic ducting, and ADT alarm/Ring security system. Corner location with approximately 10,234 sq foot lot. All this for under two hundred dollars a square foot & NO Mello-Roos!!" "Brand New Single Story Home at the new Community of Iron Horse II at Heritage Grove. Open Great Room with large kitchen island and plenty of windows to let in natural light. Large Wrap Around Covered Front Porch and Rear Covered Patio. Nice corner location. Ready for you to customize with your own personally selected finishes and upgrades. Will be built this year. Expected move-in is Nov./Dec. 2019." "Lovely 2 story home located in the Bridges Community. A spacious 2,375 sq. 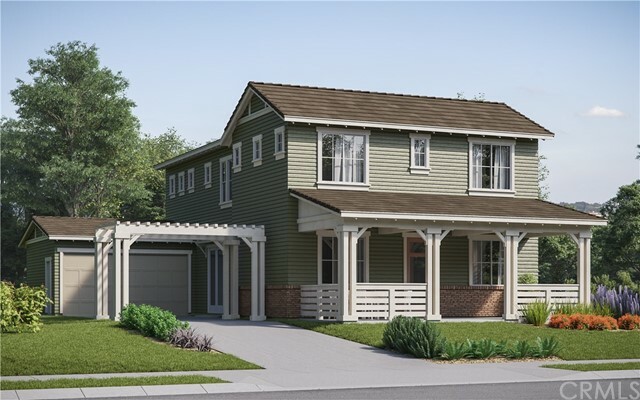 ft. floor plan offers 4 bedrooms, 3 baths, downstairs master suite and bonus room/loft. The charming front porch offers an inviting place to unwind. The entry way, kitchen and family room have easy care wood-like laminate flooring. The open family room, dining area, and kitchen combo offers plenty of space for entertaining or just relaxing. A beautiful kitchen showcases a granite island workstation/ breakfast bar with sink, stainless steel appliances and plenty of cabinet space. A large double vanity, deep soaking tub, separate shower, and walk-in closet comprise the master bath. The convenient indoor laundry includes the washer & dryer with the sale. A downstairs guest bedroom could also work well as an office. The bonus room/loft at the top of the stairs would be perfect as a teen room or study. Jack & Jill bedrooms & a bath finish off the upstairs floor plan. Some additional features are - tankless water heater, fire sprinklers and energy efficient windows. The rear of the backyard features great terracing ready for your vision." "Property was built in 1995 after the earthquake. Looks like an older property with a lot of character. Close to town and schools. New 2 car GARAGE built in 2018. A living room and a very large family room. You must see to appreciate!" "Welcome to the community of Riverwalk! This fantastic pool home has been lovingly cared for by its present owner. This Western Pacific plan 2 model offers 3 bedrooms with an extended master suite (could be 4th bedroom) plus 2 1/2 baths. The open concept of this floorplan design includes plenty of space to entertain & enjoy family and friends. The formal living and dining space have beautiful mountain views and plenty of windows for natural light and fresh air. In addition, the family room and adjoining kitchen create a warm gathering space for all. The kitchen is complete with updated cabinets, warm granite counters and plenty of storage space. Plus, there is a small office space off the kitchen and an interior laundry room for added convenience. With all the bedrooms upstairs there is both ample floor & closet space in each room. Not be missed is both the front extended custom porch area to sit and relax at the end of the day. And of course, on those hot days you can cool off with your own custom in-ground swimming pool and spa. Also, there is a covered patio and built-in BBQ to keep the outdoor fun going! And don't forget the small enclosed changing restroom for your guests. With the Summer months just around the corner this great home won't last long." "Wonderful 1900s 2 story home situated on an 11,723 square foot lot. Relaxing front porch welcomes you in. Featuring 4 bedrooms and over 2400 square feet of living space, this house is ready for you to call it home. Fresh paint and new flooring. Living and dining room plus den. Oversized garage with workshop, sits towards back of lot with long driveway." "Your chance to get in on Phase 1 Pricing at our new community of Iron Horse II. Brand new home to be built this year. Charming farm house style home with 4 bedrooms - one bedroom downstairs - 3 bathrooms plus a loft. Ready for you to customize with your own personally selected finishes. Expected move-in Nov./Dec. 2019." "Highly desired area and neighborhood. The Bridges in Fillmore.. Newer built Elementary School and Beautiful neighborhood Park with friendly kids play area and basketball court. Surround yourself with the beauty of the peaceful view of the Mountains and nature. Residences offers a bedroom and bath downstairs, inviting entrance with formal sitting area and formal dining area.Cozy fireplace is located in the Family room area opened to the large kitchen and separate breakfast nook eating area. Upstairs you will enjoy the large loft area which separates the Master bedroom from the additional 3 remaining bedrooms. Over-sized closets in each bedroom. Upstairs hall bath offers dual sinks along with a tub/shower combo. You will get lost in the extra large master bedroom, which offers a great on suite with a separate tub and shower. Gorgeous walk in closet. The exterior of the home offer RV access with slab and a larger additional side yard, perfect for a kids play area or gardening. 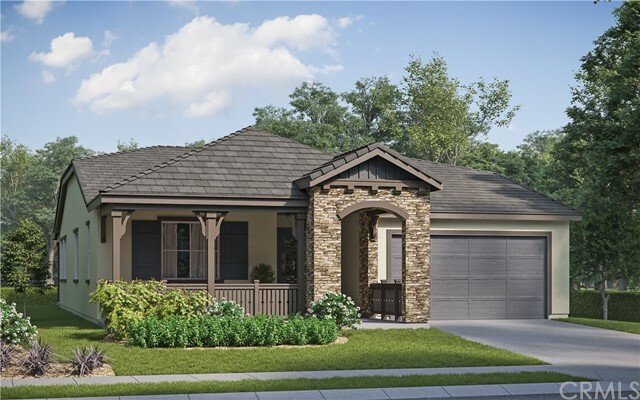 Newly Landscaped, great curb appeal.The Bridges you will love this home...Don't miss out"
"Brand New Farm House Style Home at the new Iron Horse II Community at Heritage Grove. Open Great Room with large kitchen island. Downstairs den. Covered Front Porch and Covered Rear Patio. Rear Deck to enjoy the view of the mountains. Home will be built this year. Ready for you to customize with your own personally selected finishes and upgrades. Expected move-in in Nov./Dec. 2019." "Step back in time into this 1910 Country Cottage home, situated on approximately 3/4 acre, inclusive with a second legal parcel up on the hill. This land abounds with spectacular views of the surrounding mountains. Offering peaceful tranquility and privacy all within the friendly Fillmore city limits. Enter into the screened in porch as you open the french doors to the spacious but cozy living room. The hillside abounds with beautiful views from the bay window. Charm shows throughout this 860 square foot loved home. The updated kitchen with granite counter tops is large enough for a gourmet cook to create home cooked meals to be served to guest, in the floor to ceiling mirrored room, which is open to the living room. The second bedroom could make a terrific office, it opens out to the brick spa patio. As you explore the grounds of this wonderful property...the seasonal creek that runs throught it, may be running. Steps are in place leading to many areas, waiting for your outdoor furniture for entertaining lots of guest. Plenty of parking, a single car garage and a storage building. Notice the small storage building also. The laundry has its own entrance off the patio. At days end you'll find yourself in the large master bedroom with lots of closet space and views of the hillside, which may lead you to a restful calm. Imagine...how you may be able to fulfill all your dreams, it might be right here on this property, that is your peace on earth!" "Get in on phase 1 pricing at the new community of Iron Horse II. Home to be built this year. Brand new Traditional Style home with Front Covered Porch and Rear Covered Patio. Large great room with generous size island at kitchen. Lots of windows to let in natural light. 3 bedrooms upstairs with a den downstairs. This is your chance to customize your home with your personally selected finishes and upgrades. Expected move-in in Nov./Dec. 2019." 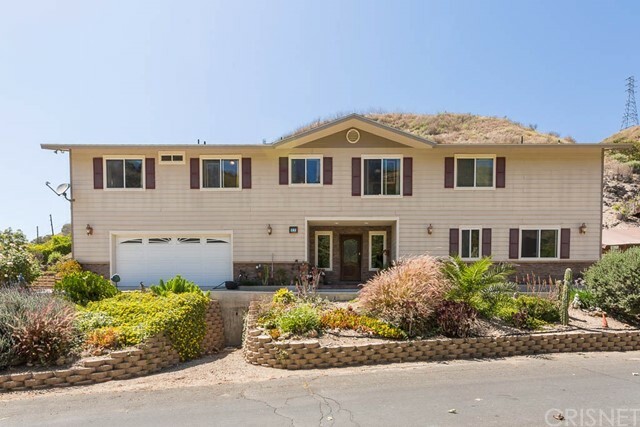 "Beautiful, recently updated, corner lot home in a wonderful Fillmore pocket community secluded near the mountainside. Views of the mountain in this beauty which features 4 bedrooms and 2 1/2 baths in the Traditions Tract. This serene setting is far enough from the city but close enough to downtown for shopping and dining. This home shows pride of ownership with many upgrades including plantation shutters, hardwood floors and tile, ceiling fans, and a small office next to the kitchen. Designer colors too. Recently serviced air conditioning unit for those warm summer days and a cozy gas fireplace to keep your home warm during those winter months. Backyard is low maintenance and perfect for entertaining with an outdoor built-in bar height counter and space for a grill and refrigerator. The corner lot offers lots of privacy too." "This home shows like a model. If you are looking to purchase a newer home, this one was built in 2016 with 3 bedrooms, 2.5 baths, and a loft in the gated community of Oak Haven. The downstairs has wood-like laminate flooring, upgraded carpet, plantation shutters throughout, high ceilings, recess lighting, and fans throughout. The kitchen boasts an island with granite countertops, stainless steel appliances, built-in desk, two pantries - with one being a walk-in. The cabinets were upgraded to an espresso color, subway backsplash, decorative lighting, and a ship-lap style decorative wall in the dining area. The master bedroom is spacious and the master bath has a separate shower and garden tub, dual sinks, and walk-in closet. The loft has wood panel/ship-lap style walls with decorative lighting. The laundry is upstairs, the second bath upstairs has adult size dual sinks. This home is equipped with a tankless water heater, solar panels, and a concrete patio has been installed in back yard which wraps around to the side yards. Garage has finished drywall. The community pool and spa is heated. The seller states it's a community with many families and kids. This home has so much to offer!" "Welcome to the City of Fillmore, known for its beautiful agriculture in the area...20 minutes to Ventura (West), 20 minutes to Santa Clarita (East) and 30 Minutes to Westlake Village (South). Conveniently located in the heart of Fillmore close to Fillmore & Western Railway! This custom built home is solid, with great living space and a location to park your boat or small RV. Also, has solar that will be yours with no balance due. Opportunity to own your own home awaits you!" "Welcome to this charming 3 bedrooms 2 bath home. Recently remodeled throughout, Upgraded kitchen cabinets and counter tops, brand new windows, AC is less than 2 years old.home property is conveniently located near a new elementary school and middle school. It is close to parks stores and schools. One of the best values in Fillmore!" "Single story ranch style 3 bedroom 2 bath home with an attached two car garage located on the east end of town on a cul-de-sac street."